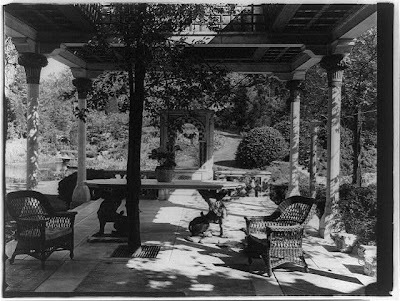 The veranda with gardens beyond at Louis C. Tiffany's 'Laurelton Hall' in Laurel Hollow. Picture from the Library of Congress. I believe this was the portico "reconstructed" at NYC's Met Museum in 2007 for the Tiffany exhibit. I think the Met's is quite taller and from another part of the house, isn't it? Picture is of The Daffodil Terrace, off the dining room, which was reconstructed for the 2007 show. The similar taller columns are part of the permanent instillation of the front loggia. Flowers on the loggia are East Indian lotus, Greek peony, opium poppy and saucer magnolia.